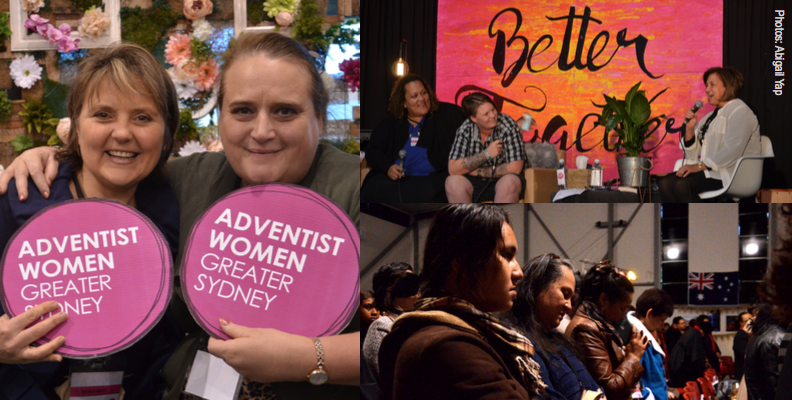 On the Sabbath of 23 July, women throughout Sydney and Australia descended upon the New South Wales suburb of Doonside to attend Breathe 2016. Held at the Mountain View Adventist College, this year’s women’s ministry event highlighted three simple things: a dollar a day, a string of words, and a decision to act. In February of this year, a cry from within the Adventist community rang out. Monique Sleight of Raw Impact had just participated on a mission trip to a rural village in Cambodia where progress in the form of a new bridge will soon force inhabitants out. Just $5,000 dollars is all it would cost for a block of land that could house one family. The women at Woollahra SDA responded by distributing coin cans. Bit by bit they raised $5k. Various efforts from women’s groups at Parramatta, Blacktown, Hurtsville and the Mt Druitt Samoan Church would bring that tally to $23k, $27k after collections taken at Breathe, which means a future for five families. BREATHE – A dollar a day, a string of words and a decision to act. During the latter part of the day, speaker Andre Afamasaga, recalled the story of the Japanese missionary he’d once heard speak, and whose ministry he felt he had to contribute to. He quickly went to an ATM and withdrew $100 dollars, but failed to find the man after he’d returned. Disappointed, he meandered to a café and happened upon a friend. A heavenly voice spoke and Andre hesitantly responded, giving the money to the friend. It turned out he’d needed it: his mother just called asking him to bring home milk, and he didn’t have the money in his account to buy it or nor the courage to tell her. A dollar a day, a string of words and a decision to act. The small is often all it takes. These things framed the essence of Breathe and the purpose posed of women’s ministry. Boiled, divided and filtered down to their very core, what is left is this: commitment, compassion and compelled. All are individually strong, but far better together for they larger reflect the will of God. To register for Breathe 2017, held Friday, 30 June – Sunday, 2 July 2017 at the TOPS Conference Centre (Bendena Gardens, Stanwell Tops, NSW 2508), visit https://sydney.adventist.org.au/ministries/adventist-women.